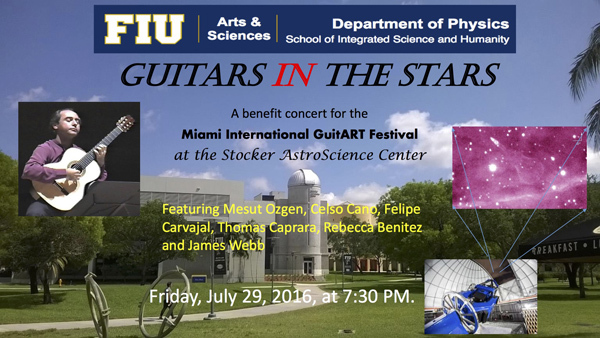 The Stocker AstroScience Center presents a Benefit Concert for the Miami International GuitART Festival, featuring guitarists Mesut Ozgen, Celso Cano, Felipe Carvajal, Thomas Caprara, James Webb, and soprano Rebecca Benitez on Friday, July 29, 2016 at 7:30pm. A wide variety of music will be performed from classical, Latin American, Spanish, Turkish, flamenco, and acoustic guitar repertoire. Seats are limited, please RSVP to webbj@fiu.edu. The fundraiser event will start with a reception at the 1st floor exhibition hall in the Stocker AstroScience Center ASTRO 101 at 7:30pm and the concert will start at 8pm. After the concert, you will have a chance to meet the artists and join tours of the observatory, control room, and visual observing with telescopes, including the wonderful 24″ automated telescope if weather permits.